Cignal subscribers now have more convenient options to pay their Cignal bills. 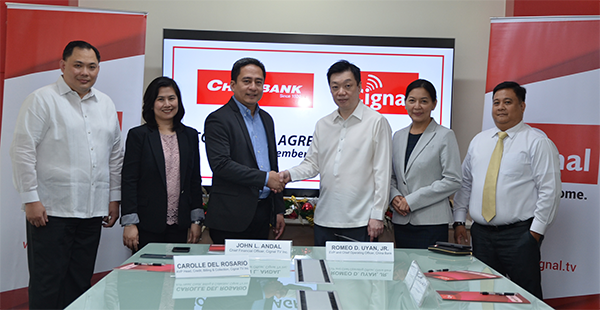 China Bank and Cignal TV recently signed a collection agreement for the acceptance of Cignal TV payments at all China Bank branches nationwide, through China Bank Online, and via automatic debit arrangement. Cignal TV CFO John Andal and China Bank COO Romeo Uyan (center, shaking hands) led the signing, together with (from left) China Bank’s Jonathan Valeros, Cash Management Services Division (CMSD) Business Development Head; Cignal TV’s Carolynn del Rosario-Cruz, Credit, Billing & Collections Head; and China Bank’s Charmaine Santos, Metro Manila South Area 1 Head and Domingo Dayro Jr., CMSD Head.